A Natural Kidney & Bladder Remedy? There are between 60 and 130 different varieties of our featured herb, goldenrod. According to old folklore, finding some near your house meant the people who resided there would have good fortune. In fact, one variety was even known as the “Liberty tea,” since after the Boston Tea Party in 1773, the only good alternative for tea was goldenrod tea. Goldenrod gets a bad rap from allergy sufferers, as it's often falsely accused of being responsible for annual allergies. In actuality, it’s ragweed that blooms around the same time that is the culprit. As with most herbs, goldenrod is more than just a common garden plant, it also serves as a natural remedy that has been used to treat people across three continents with a variety of medical conditions related to both the kidney and bladder for centuries. Most commonly, Goldenrod is used as an aquaretic agent, meaning that it promotes the loss of water from the body (as compared to a diuretic, which promotes the loss of both water and electrolytes such as salt). Several studies have found that goldenrod does in fact increase urine flow. It is used frequently in Europe to treat urinary tract inflammation and to prevent or treat kidney stones. In fact, goldenrod has received official recognition in Germany for its effectiveness in getting rid of kidney stones, and it is commonly found in teas and tinctures to help "flush out" kidney stones and stop inflammatory diseases of the urinary tract. Goldenrod is said to wash out bacteria and kidney stones by increasing the flow of urine and also soothing inflamed tissues and calming muscle spasms in the urinary tract. It usually isn't used as a cure by itself, but rather as an adjunct to other, more definitive treatments such as (in the case of bladder infections) antibiotics. For these reasons, you’ll find it as an ingredient in Jon Barron’s herbal kidney flush formula. In addition, according to the University of Maryland Medical Center, goldenrod (Solidago canadensis or Solidago virgaurea) has historically been used on the skin to heal wounds. In folk medicine, it is used as a mouth rinse to treat inflammation of the mouth and throat. Goldenrod is also associated with helping relieve symptoms associated with the common cold, flu, bronchitis, laryngitis and other similar ailments of the respiratory tract. And it has been used to help treat digestive issues such as colic, diarrhea and stomach cramps as well. Typically, goldenrod is ingested in a dried form, but it's also commonly used in tinctures and fluid extracts. 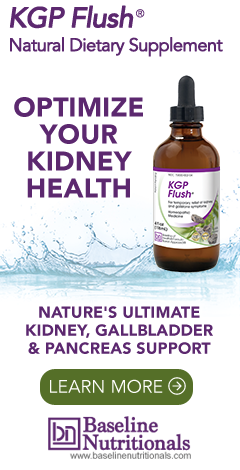 For example, as mentioned earlier, Jon Barron uses goldenrod in his kidney flush formula which can be used to address specific need, or as a kidney detox to cleanse the kidney and bladder when undergoing a full body detox. Learn more about kidney cleanses and detoxing.